US, 1987, 113 minutes, Colour. Mickey Rourke, Robert de Niro, Lisa Bonet, Charlotte Rampling. 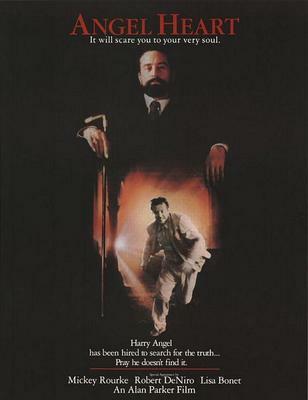 Angel Heart is a film about the Devil, evil, selling one’s soul to the Devil. The film opens in New York in the 1950s but soon moves to New Orleans and its strange atmosphere, voodoo religion, the centre for the presence of the Devil. Mickey Rourke portrays a private detective who is asked to meet with a rich client, Louis Cyphre (Robert de Niro) in order to find a singer who has disappeared during the war. The detective’s journey takes him through a maze in New Orleans, especially through the wealthy families, the poor families, the voodoo and its rituals. What emerges is that the detective is seeking himself, the singer who made a bargain with the Devil and who now, unbeknown to himself, is doing the Devil’s work. This is a good star vehicle for Mickey Rourke in his heyday. Robert de Niro is Louis Cyphre (Lucifer) and is often enthroned on a chair, the picture of sinister evil. In the same year, de Niro made The Untouchables where he portrayed Al Capone. Direction is by Englishman Alan Parker who had a strong career during the 1980s, especially in the United States with such films as Fame, Shoot the Moon. He was to go on to make Midnight Express. 1. The impact of the film? Its credibility? A portrait of the Devil, the Faust pact and selling one’s soul? The work of Alan Parker, the Englishman working in the United States? 2. The atmospheres, New York City, 1995, dark, sinister, bloodthirsty, Harlem? The comparison with New Orleans, the city itself, dark and light? The voodoo world? New Orleans society? Hellish, hot, the fans? Dreams? The atmosphere and the environment? The musical score and mood? 3. The themes, the religious songs, 'The Girl of My Dreams’, the piano score? 4. The title, the original novel being called Falling Angel, Harry Angel and the Devil, Hell and the selling of one’s soul? 5. The long tradition of the Faust legend, the selling of one’s soul, the persuasiveness of the Devil, the human enjoying the limited extent of the bargain? Having to surrender the soul? 6. The world of the private eye, Harry Angel, seedy, wandering, friends? The office and the visit of Winesap, the interview with Louis Cyphre, the task? The background of Harlem, the African Americans, the money, religion? The interaction with Cyphre and the beginning of his mission? 7. Mickey Rourke as Harry Angel? Character, screen presence, impact and style? His work of twelve years, the 1940s and 1950s, the memories? His skills in investigation? The hospital and the girl, the doctor and the morphine? Death and the fingerprints? The meeting with Cyphre? The beach, his nose? The wife in the water, the information about the man and the woman – and Johnny Favorite? 8. Descriptions of Johnny Favorite, his career, the place of Margaret in his life? Evangeline? The injuries, the disappearance? Harry and New Orleans, the mirrors, the visions, his fear? Understanding his self, seeking his own identity? The revelation of Cyphre as the Devil, demanding his soul, the descent into Hell? The portrait of evil? 9. The doctor, Coney Island, the funeral chase – at the tip? 10. New Orleans, the mood of the city, tap dancing, the heat, the hotel? Mama Carter’s? Evangeline’s grave and Epiphany? The chickens and the rituals? The information that he was seeking, his search for Johnny Favorite? Toots and his plane, the toilet, the chicken? The voodoo ceremonies? Toots and his visit, death? The chase, the dog and the biting? Margaret, the tram? Palm, information and reaction, her death? Epiphany and the boy, the sexual encounter, the vision and the blood? The intervention of the police? 11. Mr Kruzemark and the contact, Margaret, the truth, the world of evil, ritual and death? 12. Cyphre and his character, appearance, information, the finale and his desperation, revealed as the Devil? 13. The effect of the revelation on Harry Angel? 14. The supporting characters, Epiphany, her place in New Orleans, the rituals, sexuality? Margaret and her father, Margaret’s death? 15. The religious background, the struggle between good and evil, the pessimistic ending with Hell?